RLDC 4 REGISTRATION IS NOW OPEN! Early Bird pricing ends January 26 at 11:59pm ET. Regular pricing ends February 2 at 11:59pm ET. Late registration with lodging ends February 6 at 11:59pm ET. Late pricing also applies to onsite registration. The SHPE RLDCs empower undergraduate and graduate students, as well as, professional members to realize their fullest potential. The training at these regional leadership conferences equips attendees to lead in their chapters and at work. Guided by experienced leaders, RLDC participants are fully inspired to impact the STEM community. Career Fair with Public and Private Sector companies, including MITRE Corporation, JP Morgan Chase & Co., S&P Global, Cummins, America’s NAVY, AECOM, Proctor & Gamble, Wake Forest University, and many more to come! Use our official hashtags throughout R4LDC! 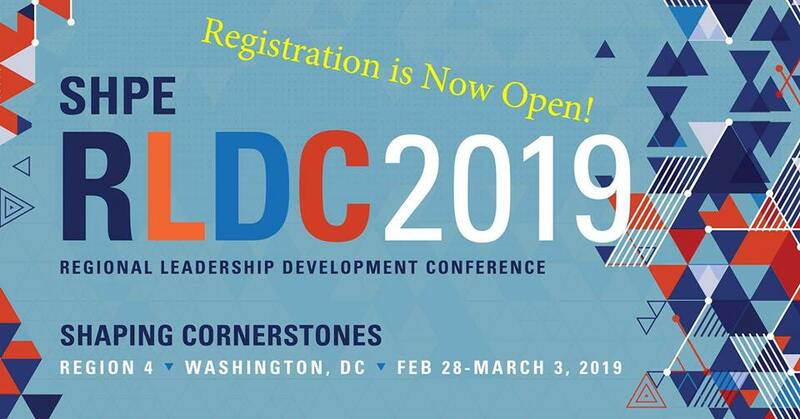 RLDC 4 this year is taking place in the Washington, DC metro area! The hotel and venue are a short metro ride away from each other. The “RLDC 4 Travel Guide” should answer many of your travel-related questions.